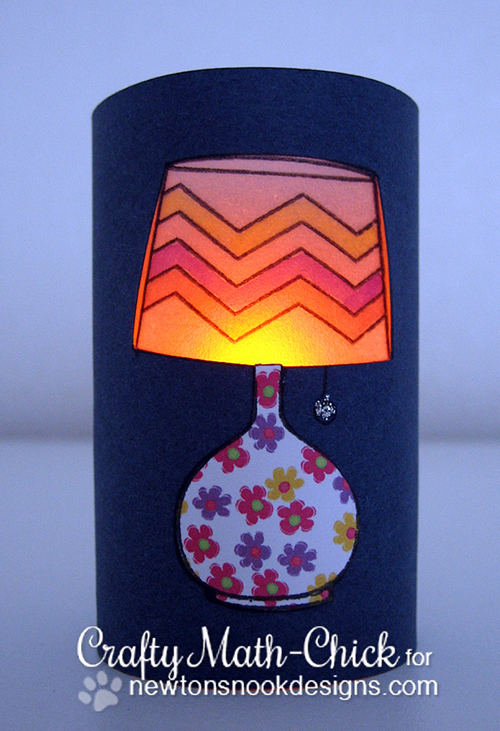 Light up someones day with a fun paper-crafted luminary! Crafty Math-Chick is showcasing our new Around the House stamp set in such a creative way today. She used our fun Lamp image with some vellum to create a fun little luminary that lets the light shine through from behind - it's a little battery-operated tea light back there - don't use a real candle - LOL! I love how pretty the lamp looks with that light shining through. It would be so fun to make up a bunch of these for a summer BBQ outside, wouldn't it? To learn more about her project and see what else she's up to, pop over to Crafty Math Chick's blog, Canines and Card Designs and say hello! I love how she used the vellum and that allows for this wonderful glow! Where'd my comment go lol? I love this card design and colors! Brilliant (yup, I said it) and kudos to you for dreaming this one up!!! this is genius!!!!! love love love this idea!!!! Inky Paws Challenge #10 - Wood, Cork, Metal! ah-ha! Great IDEA by Samantha Mann! May Release Available + Blog Hop Winners! Inky Paws Challenge #9 Winners!! Sweet Winston Tag by Taheerah Atchia! Introducing - May Release Guest Designers! Fun Mom Card & Video by Christine Drogt!